In order to get ourselves set up and working, we quickly built some shelves out of plywood and two by fours, and a workbench out of the same. 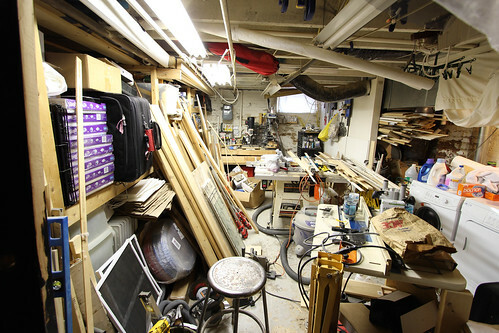 Ever since, our basement has played triple duty as a storage area, laundry area, and our workshop. This triple play was less than ideal, essentially making the space fight over all three, doing none of the three particularly well. Not to mention that due to the shared space with the workshop, the storage and laundry areas were perpetually covered in a layer of saw dust. Needless to say, it was less than ideal. Over this summer we needed to address some of the issues that have been impacting our basement, which included installing a French drain and sump pump to resolve periodic water infiltration following heavy rains, and correcting the out of level floor by working with a contractor to remove the old slab and pour the new. 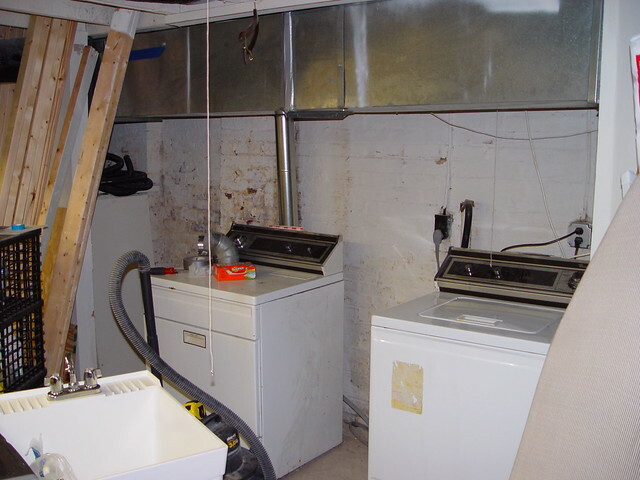 While we're at it, we're also removing the old and horribly inefficient forced air furnace. 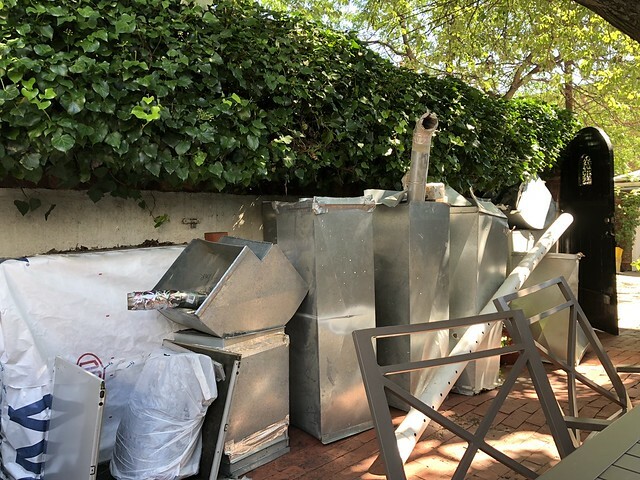 We're replacing it with a high efficiency boiler that will heat the first floor of our house with below floor radiant heat, and the second floor with a hydronic coil on our attic heat pump. We're looking forward to having a more efficient heating system, and the bonus is that switching over to radiant heat will free up a lot of space in the basement because the bulky ductwork is no longer needed. This is another project I've wanted to take on for about 10 years or so, and we're finally doing it! 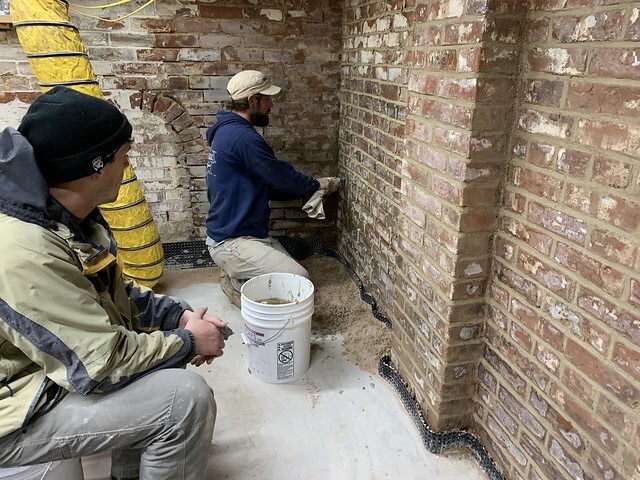 If you've been following us on Instagram, you've seen a few of our in progress shots that involve the restoration and repointing of the 130+ year old beautiful masonry walls. 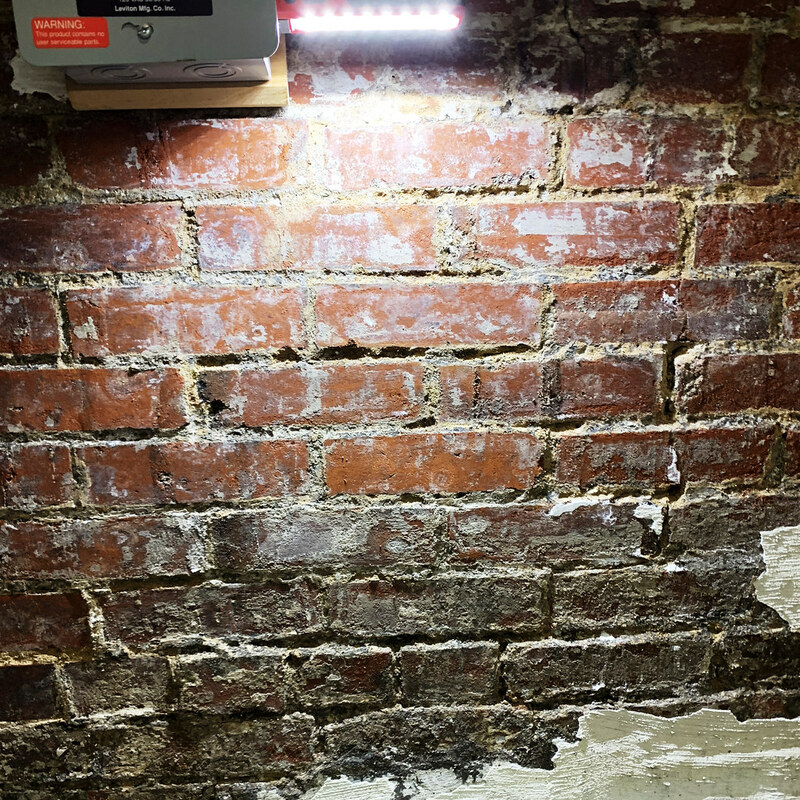 This is a tall task that involves stripping old Drylok waterproofing paint, removing some cement mortar from an old (and bad) repointing job, removing what appears to be plaster from other attempts at repointing, and generally trying to clean up all of the masonry. This whole project has been a tremendously time consuming and exhausting undertaking. This, coupled with other projects and a very busy work schedule, have kept us pretty quiet on the blog the last several months. 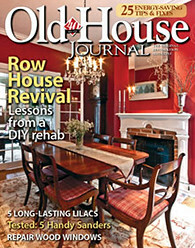 We're also working with a few contractors on this project, which is a bit outside of our norm. But if we want to get this done in a semi-reasonable amount of time, we've had to figure out what we should hire out vs. what we should take on ourselves. It wasn't an easy decision by any means, but working with a few good contractors that we know and trust certainly makes things much easier. So, what's the plan? We're turning the basement into two truly separate areas. One third of the space will be a laundry and storage area for bulk grocery and cleaning supplies, a few of Wendy's real estate staging items and signs, and other household items that we want to keep clean. It will be separate from the workshop, away from the dust and grime that is unavoidable when working on projects. 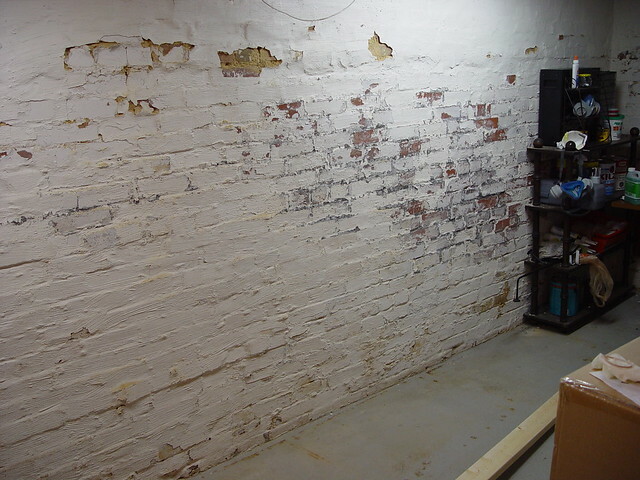 The other two thirds of the basement will be a real, actual workshop. The workshop space will be about 20'x14' and will house several moveable cabinet and workbench components that I plan on building over the next several months. The whole project is major and will take a good while to complete. Our goal is to keep you all updated as portions of the project progress. So, are you ready for the fun? While it's not your typical fancy Pinterest-worthy before and after kitchen or bath makeover, we can't wait for this project to come together. After all, this is a project we weren't sure would ever actually happen, so seeing it in the middle of the chaos is truly exciting! All of the stuff in the basement had to come out, and I think that was the single most daunting aspect of this work. Welcome back. Figured you were mired in something huge. Looking forward to seeing your progress. Are you planning on keeping those beautiful brick walls exposed or do you plan on repainting them? Because man, those are lovely. Definitely going to be keeping them exposed, especially in the workshop space. The laundry area will probably be covered a bit by cabinets. Those bricks really are glorious. Kudos to you for tackling such an unglamorous project. You should definitely throw a Cellar-bration when you’re done. Invite your friends to a party in the basement, and Cellar-brate a space they might not otherwise visit. I think this is a spectacular idea! This is so awesome! I had no idea that you could actually take out and repour a basement slab. I don't remember-- do you guys have access from the basement directly outside? I can't imagine dragging all that rubble through the house, oy! Having dedicated project/laundry spaces is gonna be so sweet. I look forward to your progress posts! It was a long, slow, and messy process. 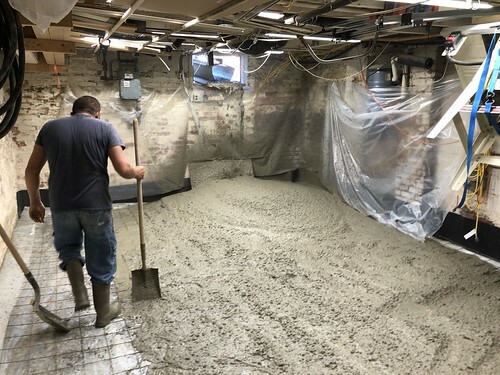 We don't have access from the outside, so much of the slab was removed through the small front basement window, and the rest with 5 gallon buckets walked through the house. It was a total mess that we cleaned up from every single evening of the weeks long process. How did you get the old Drylok off the bricks without damaging the bricks? We have Drylok on our bricks, but our bricks are so old that I'm afraid if we touch them (or even look at them wrong) they will disintegrate into dust! Still trying to figure out how to repoint with Drylok on top. It's a major work in progress. I've tried everything I can think of, from chemicals to brute force. The end result is that nothing works particularly well and it's a slow and hard process. The crumbling on your bricks may actually be related to the drylok, as we've had it in a few places. The Drylok holds moisture against the face of the old soft brick, and starts to make it fall apart (sort of like spalling does with concrete mortar on soft brick). In some places ours came off without issue where the Drylok had failed, but in most cases it's staying put and I'm having to fracture it along the mortar line to get it off of the brick. I'll surely be doing a blog post on this topic specifically. This project will bring you many years of satisfaction… Every time you walk in to the space you will feel accomplishment! Love the exposed brick.. This is such a worthy project. You are going to love this space when it is finished. Love the brick walls! Will there be any room for a wine cellar? This is very impressive. You must be so overwhelmed and so pleased at the same time. What did you do with the basement contents that you have to move? I'm particularly interested in this as I have a basement with similar issues. Curious to know how you will cool the house without ductwork? Looks great, must feel good to finally get the basement sorted - I think we're all guilty of having one of those rooms with big plans that never actually happen! Good luck with the finishing touches. 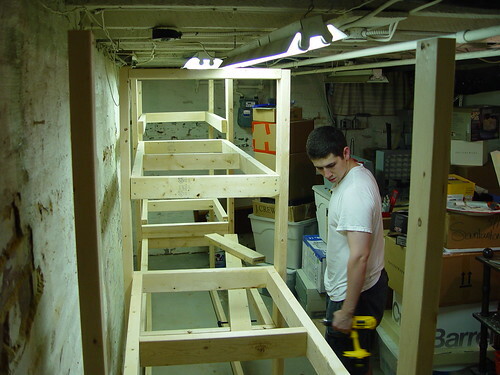 Hi Alex, thanks for sharing your basement project. I really like what you done to the bricks. It must of taken ages to achieve that look! well done to you! I look forward to your next post. Absolutely amazing. So much work involved. We just replaced a 50 year old furnace, this past fall. Only one I've ever seen made by Chrysler. We finally couldn't find anyone who wanted to touch it! You did a splendid job and now I'm going to go read about your Christmas trees! how many flooring layers are constructing in the basement? 2 or 3? Hello! I was wondering if you were going to be waterproofing your basement when you did it? I'm curious because I was thinking of waterproofing my basement through Stay Dry. Like many others have said the bricks look amazing. Props to you for taking on such a tough project, well done!